photo enforcement locations on your driving routes while recording high quality videos at the same time. the X500 is able to record pristine quality video that captures the crucial details of any incidents you may encounter while driving. you can rely on the X500 to capture every moment of your commute in high definition – be it an accident or an unexpected hit-and-run. 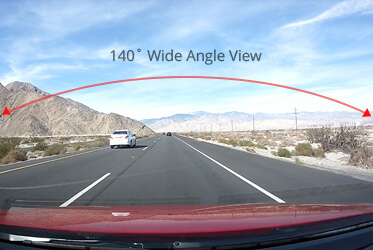 The THINKWARE Dash Cam X500 has a 140˚ wide viewing angle for maximum visibility, capturing a wider view of the roads. The high specification Ambarella A7 CPU minimizes power consumption while providing optimal performance. Tested and proven in various high quality action cameras, the processor ensures a stable and uninterrupted performance while the X500 performs various tasks. With a built-in GPS antenna, the X500 embeds speed, time and location data to the recorded videos to give you all the crucial information you need after an incident. This technology is specially designed to save recorded footage in both Micro SD and NAND Flash Memory when a certain level of impact is detected. This is particularly useful if the Micro SD card is removed or damaged due to the impact of a collision. With the Dual Save Technology that also saves footage in the NAND Flash Memory, you do not have to worry about it getting lost or damaged. You can immediately check the video saved in the NAND Flash Memory on the X500 Clear Display or copy it to the Micro SD Card and check it on the PC or MAC viewer. When using a 3M tape, it firmly secures the camera to the screen so no vibration is generated. The 3M tape firmly attaches to the screen regardless of impact, low or high temperature. While minimizing reflections from the car window, the 3M tape allows users to firmly attach it to their desired spot. Automatic Temperature Sensitive Shutdown ProtectionSpecially designed heat-discharging structure and high-temperature-blocking functions safely protect the product and its images stored under the strong sunlight. If the temperature rises and exceeds a certain level, the SELF-PROTECTION SHUTDOWN function will automatically switch off the device to protect the stored videos.